Looking for the best cheaper alternatives to Vitamix blenders? You've come to the right place. There are more options out there than you might think. 5 awesome and affordable alternatives to a Vitamix (and why we picked them). A deep dive into the 5 alternative blenders and the attributes they offer. Whether or not you should consider a refurbished Vitamix. The Cleanblend is a high power blender that comes with a tamper and actually looks similar to a Vitamix. It also has a solid 5-year warranty and can handle most of the same tasks. The Oster Versa Pro has a similar design to the Vitamix and also comes with a tamper which will make quick work of thick blends and hot soups. All with a long warranty. We picked this because of its raw power and long warranty. Anything you can do in a Vitamix, you can do in a Blendtec, especially with the Twister Jar. While it won't quite measure up in raw performance to a Vitamix, its a cheaper alternative which is super convenient. Perfect for simple jobs like green smoothies, but can also handle many other things. Did you know that you can get a Vitamix for much cheaper if you get one refurbished? It works just as well and still comes with a long 5-year warranty. Let's be clear, the Vitamix is one of the top blenders on the market. You can't just take any old blender and put it up against a Vitamix. Their 7+ year warranties are long and reliable. The powerful motors can handle making thick spreads such as almond butter with ease. Vitamix blades are dull and rely on power and pulverizing rather than cutting which preserves long term functionality. They have solid ice crushing capabilities and be able to make frozen desserts. Vitamix blenders can make hot soups right inside of the blender with the friction of the blades. Many of the newer models are designed to fit under kitchen cabinets. We'll use these incredible features as criteria by which to compare other blenders to a Vitamix. In addition, if the blender we're comparing has other features that make it stand out, we'll be sure to mention those too. For the sake of comparison, we'll use the Vitamix 750 as our standard as it is one of their newer and updated models. The Oster Versa Pro 1400-watt blender is a natural alternative to the Vitamix. It's marketed as a "Performance Blender at a Fraction of the Price". Oster very intentionally positions themselves as a cheaper alternative to a Vitamix. Their blender even looks similar to the Vitamix and comes with a tamper. In case you don't want to read the entire comparison, here are the main takeaway points when considering an Oster Versa Pro in place of a Vitamix. The Oster has a 7-year limited warranty like the Vitamix and the jars are inexpensive to replace. The Oster has slightly less power than the Vitamix, but a regular user probably won't notice this too much in the final product. The Oster Versa Pro has a low-profile which is great for storage under low hanging kitchen cabinets, but an overall wider footprint than the Vitamix 750. With the inclusion of the tamper, the Oster can produce nut butters and smoothies of similar quality to a Vitamix. The Oster has a hot soup function and performs well on that front. 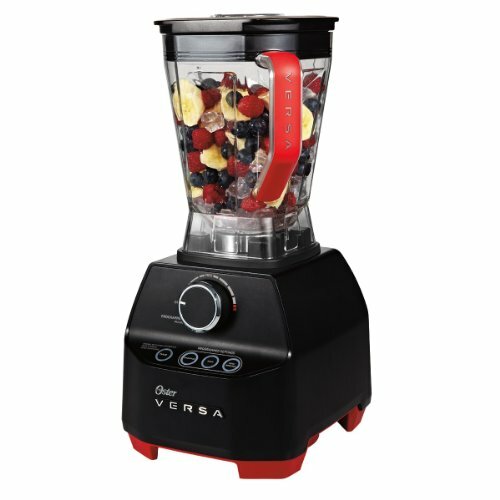 The Oster Versa comes with a 7-year limited warranty which is the same length of time as the Vitamix. 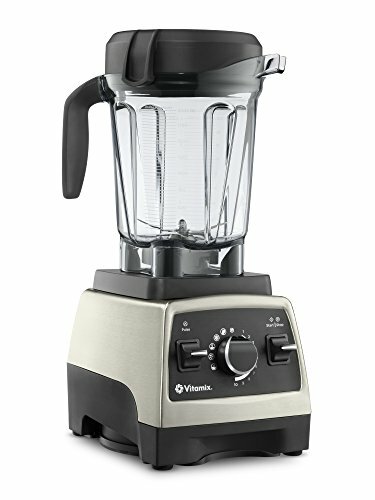 Although the time that the blender is covered is the same,​ Vitamix has a long-standing reputation of standing by their warranties. Oster seems to do the same most of the time, but there have been mixed reports. You can read their user manual for full warranty details. The 1400 watts that the Oster has translates to around 1.8 Horsepower. This is a bit lower compared to the Vitamix's 2.2 peak-HP. The difference in smoothie quality that this translates to is probably not going to be too apparent most of the time, especially if you are using the tamper and not making something extremely thick. This may be particularly noticeable if you're tossing in​ entire whole fruits or vegetables which we've seen on a few different blend tests. However, the reality is ​that the differences will be subtle, especially if you take pre-cut your ingredients before hand, or steam any super hard vegetables. Not to mention, the differences will become even more subtle the longer you're blending something as the entire contents will become more liquefied. Just like the Vitamix, the Oster has blades that are built into the jar rather than the base of the blender itself. The jar has a little widget on the bottom which attaches directly to the base of the blender. The Oster blades are slightly jagged on the edges and dulling doesn't seem to be much of an issue with it. One common complaint are that the blades will become wobbly or slightly detached from the base, but Oster does seem to be pretty good about replacing them so long as its a manufacturing defect. The Oster Versa is fully capable of making both nut butters and frozen desserts. Although the blender has less power than the Vitamix, it has enough to get the job done on both fronts. The tamper gives the Oster an edge over other blenders with similar wattage. This is because you can push the nuts or frozen fruit right into the blades. This direct contact will cause the ingredients to get pulverized and smoothed out. Making hot soups is something that the Oster Versa can handle quite well. It has more than enough power to make soups hot from the friction of blending. The jar on the Oster also has the proper ventilation capabilities if things start becoming too hot. Not to mention,​ it comes with a pre-programmed soup setting which makes the process easy. If you've tried to make soup on a blender without a pre-programmed setting, there's quite a bit of babysitting involved. It also has a knob to control blender speed as well as a pulse function, just like the Vitamix. The latest Oster which we've featured above does come with a low-profile jar like the Vitamix 750. The Oster measures in at H: 12.1" x W:16.8" x L:11.6" which is a lot smaller in height than the Vitamix's H:17.5" x W:9.4" x L:7.7". If you've got low hanging kitchen cabinets, the Oster has a slight advantage. However, the Vitamix does have a smaller overall footprint. At the end of the day, neither is actually superior on this front. It kind of just depends on your unique situation. When thinking about competition for the Vitamix, one of the first brands that comes to mind is Blendtec. Blendtec is known for blenders that have​ an immense amount of power, in some cases, more power than a Vitamix! They have their own popular advertising campaign called "Will It Blend"? The video below illustrates, in a humorous way, just how powerful Blendtec Blenders are. But how does it actually compare when stacked up against a Vitamix? In case you don't want to read the full comparison, here are the main things to think about if you're considering a Blendtec Total Blender as a Vitamix alternative. The Blendtec Total Blender has the same standard 7-year warranty as the Vitamix 750. The Blendtec actually has a more powerful motor than the Vitamix, but doesn't come standard with a tamper to push ingredients into the blades. 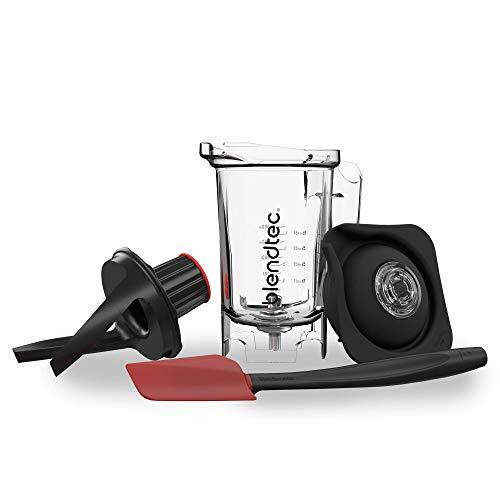 As an alternative to the tamper, Blendtec offers their Twister Jar as a seperate entity in case ingredients get caught on the side of the blender. You should be able to make the same quality nut butters, smoothies, and frozen desserts as the Vitamix, but without the Twister jar, you may have to shift ingredients between cycles. It has a lower profile than the Vitamix 750 meaning that will be easier to store and fit under kitchen cabinets. You can pick up a refurbished unit with a lesser warranty and potentially save some money. Blendtec is one of the few brands on the market that offers a warranty that's comparable to what Vitamix offers. 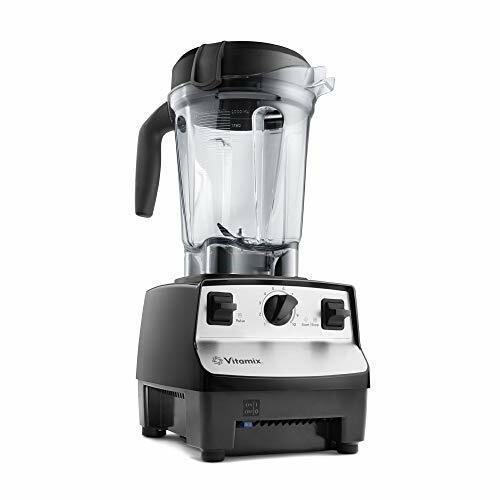 New Vitamix models, such as the Vitamix 750​ come standard with a 7 year warranty. Low and behold, the Blendtec Designer Series has the exact same thing! So on the warranty front, the Blendtec Designer Series is equal to Vitamix! You can buy either of these blenders with peace of mind knowing that you're covered for 7-years should there be a manufacturing defect within that time. The Blendtec Designer Series is actually more powerful than the Vitamix 750 and any other Vitamix that we've seen. The Blendtec Designer Series has a whopping 3-peak horsepower motor while the Vitamix 750's is 2.2 horsepower. You see, the Blendtec's design is reliant on a powerful motor. Unlike the Vitamix, which has a tamper, the Blendtec doesn't have anything to assist you if the ingredients aren't blending. Granted, there may be some exceptions. There were a few instances where things got jammed up such as when we were making cookie dough and nut butter in our Blendtec. However, this problem is solved with a little manual adjusting of the ingredients between blends or by the Blendtec Twister Jar which we'll get into below. Both Vitamix and Blendtec use dull blades. This may seem kind of strange, but its actually a great feature. Having dull blades means that they don't need to be sharp to blend things. If they don't need to be sharp, then they won't dull over time! Get it? If you get a Vitamix or a Blendtec, you can rest assured that you're getting blades that are good enough for the job. The Blendtec Total is a great blender for nut butters. Given its power, it has no problem completely pulverizing nuts and making them smooth. Now, we have seen some issues where sometimes dry blends like nut butters will have a hard time finding their way to the Blendtec Blades. Without the tamper, things can sometimes get stuck on the side and not make it to the blades. If you find that your dry ingredients are getting jammed up in the Blendtec, you can always purchase a Blendtec Twister Jar (pictured below). The Twister Jar is Blendtec's answer to the Vitamix's tamper. Rather than pushing food into the blades like the tamper, the Twister Jar gives you a handle to turn the ingredients in the Blendtec to keep it moving and away from the sides. The Blendtecs powerful motor won't have any problem with ice or frozen fruit for smoothies, especially if its a standard smoothie recipe. However, the Twister Jar can come in handy if you're making a frozen dessert that's 100% fruit and no added liquid. Again, the Twister Jar is a great solution to this if you're having trouble, but odds are the everyday user won't need it. Finally, the Blendtec rocks at soups! As a matter of fact, it has a hot soup function right on the interface. This means you can literally make it in the push of a button. Having this function is actually quite the convenience. Quick Note: Because both the Vitamix and the Blendtec have a multitude of settings, this allows ​you to make chunky soup and add different textures to an otherwise uniform puree. Once you blend your soup base, its going to turn out like a puree which is going to be completely liquefied. At this stage, you can a whole food to the blender, such as a tomato, and do a quick pulse. This make the tomato chunky and add an extra textural element to the soup. The Blendtec Total Blender actually has a much more simplistic control panel than the Vitamix. The most prominent thing on the control panel are this blenders pre-programmed settings. With these settings, you just load your ingredients in, press a button, and walk away. It also has 10-speed adjustment buttons and a pulse function. You can press the adjustment (+ and -) buttons to do different blend speeds without any of the pre-programmed settings. To increase the speed, simply press + and to reduce it you'd press the - button. You'd use these buttons much like you'd use the Vitamix adjustment knob. Blendtec has been making wide containers for quite a long time. The advantage to a wide container is that its more likely to fit under a set of kitchen cabinets or within a kitchen storage pantry. 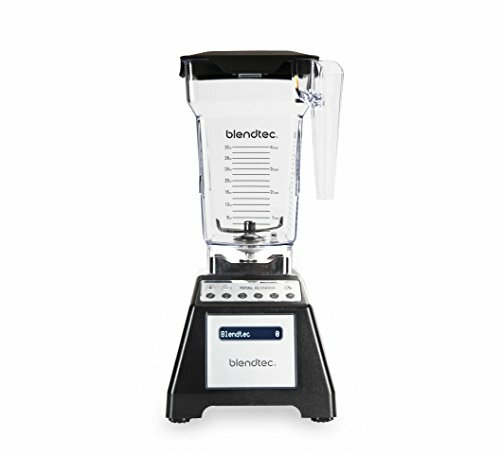 The dimensions of the Blendtec Total Blender​ are: 7" wide x 15" tall x 8" deep. While this isn't as small as something like a Nutribullet or other personal blender, its designed to have a low-profile. It's actually slightly shorter than the low-profile Vitamix models such as the Vitamix 750 which measures in at: 17.5" x 9.4" x 7.7". So when it comes to the sizing, we'd actually give it a slight edge over the low profile Vitamix models. If you don't have a large family and plan mostly on making simple things like smoothies, then the Nutri Ninja BL682 is a fantastic option. While its obviously lacking in some of the functionality and power of a Vitamix, it still makes for a cheap alternative worthy of consideration. It doesn't have the long warranty like the Vitamix has, but can be much more budget friendly to begin with. Its perfect for someone that's going to be doing simple blending jobs, like smoothies. The Ninja cups make it super portable and easy to take drinks on the go. You can get away with making cold soups and heating them up on the stove after. Nut butters can still be achieved with a bit of work and a few tweaks. OK, so the Nutri Ninja Blender has a vastly inferior warranty to a Vitamix, but this is to be expected. These two blenders are in a completely different class. The Nutri Ninja comes with a one year warranty​ according to their user manual. They also explicitly state that you have to be $19.95 to cover the cost of shipping and handling. With a 1.3 mechanical horsepower or 1000 watt motor, this Nutri Ninja is obviously a lot less powerful than the Vitamix. This Ninja Blender uses a differently shaped extractor blade which has 6 edges, if you count the two blade like prongs in the middle. Because of the way they are designed, they can really break down fruits, veggies, seeds​ even without a motor as powerful as a Vitamix. These blades are likely to be less durable than the expensive Vitamix and obviously have a shorter warranty period. The good news is that the blades are easy to replace, so its not a huge deal if they stop working as well over time. All the replacement parts for this unit, cups, gaskets, blades, etc. - can all be found online for a relatively cheap price. When it comes to hot soups and nut butters, this small Nutri Ninja simply isn't the best pick compared to the other blenders. This blender will work great for blending up a bunch of vegetables with some broth added in, but you'll have to put the soup on the stove after to cook it all the way through. Should you want to make a cold soup, like a gazpacho, then go for it! With a Vitamix, making almond butter is as simple as throwing some nuts in and pushing them into the blades with the tamper.​ You won't be able to do this nearly as well with the BL482. Let's be clear, it can​ make almond butters and other nut butters, it just won't do it as well as a Vitamix. It will also likely require a bit of mixing between multiple blade cycles. However, by roasting the nuts or adding some liquid ingredients (such as maple syrup or a bit of nut butter that's already done), you should be able to speed up the process. The Nutri Ninja will handle frozen desserts and fruits just fine, but again, you'll likely just need to use a bit more liquid to get things to move around without a tamper. As a personal blender, this Nutri Ninja IQ is going to be a lot different to control than a Vitamix. The Blend and Ultra Blend settings are time sensitive pre-programmed settings designed to break down frozen fruits and seeds. As one might think, the Ultra Blend is the more powerful of the two. 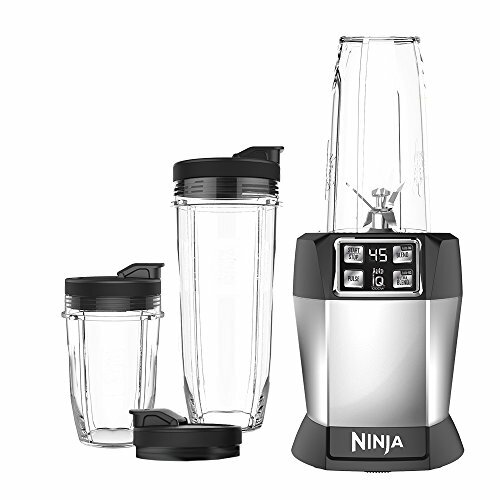 The Nutri Ninja IQ is obviously much smaller than a Vitamix, which makes it ideal for users that live in small apartments or simply don't have enough storage space in their kitchen. ​The entire blender measures 6 x 6 x 15.5 in, but since it has a variety of cups that you can use, the assembled size is going to vary. Either way, you should have no issue getting the Nutri Ninja into a small cabinet. It's also super light at around 9.1 pounds which is convenient when you're caught up multitasking when cooking. It doesn't have the 7-year warranty like the Vitamix has, but can be much more budget friendly to begin with. Their warranty is still rather long (5 years) and extra time can be purchased separately. 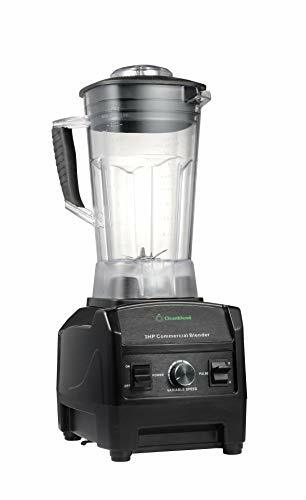 It has a super powerful motor and a tamper which make it ideal for all of the hardest blending tasks: soups, fruit smoothies, frozen desserts, and nut butters. It has a similar control panel to a Vitamix and thus operates very similarly. It's a bit on the tall side, but the company does seem to be releasing lower-profile containers sold separately. The CleanBlend comes with a 5 year warranty - just like a refurbished Vitamix and is meant to cover any manufacturing faults. Their warranty can also be extended to ten years for an additional cost. Please note that their warranty is only valid in US and Canada. The Cleanblend has a 3HP / 1800 watt motor which is just as powerful as a Blendtec and more powerful than the Vitamix. Again, the power of the blender isn't everything. Overall engineering and blade design/quality​ also come into play when determining what the finished product will look like. Much like the Vitamix, the Cleanblend has the blades that are attached directly to the jar of the blender. It shouldn't be much of an issue, especially if you clean the jar shortly after use. However, if you let things sit for a while, it can be a slight inconvenience to clean under the blades. The blade has a 6 blade configuration, quite similar to the Ninja. The Cleanblend has the capability to handle nut butters with ease, thanks to its powerful motor and tamper. Making nut butter is as simple as making it in the Vitamix with no extra liquids needed or shifting around necassary. Simply put the nuts in, pulse to get things going, and then blend regularly while pushing the nuts into the blades with the tamper. When it comes to making hot soups, the Cleanblend certainly has the capability, although the company doesn't really advertise it as such. Despite this, there have been many user reports of people making hot soups with the Cleanblend and the company seems to have confirmed the blender's ability to do so on their tomato soup recipe. With the tamper and powerful motor, making smooth and creamy frozen desserts and smoothies is easy for the Cleanblend. Even if you need to use just a little bit of liquid to make everything blend well, you can make full frozen desserts that aren't liquefied like a smoothie. The control panel of the Cleanblend is eerily similar to that of the Vitamix machines. It has a variable speed button, an on and off switch, and a pulse switch. Much like the Vitamix, you'd load the ingredients in, start the blend slowly, and increase the speed with the knob until you've got the right texture. The CleanBlend measure in at 14 x 19 x 12 in, so its taller than the low profile Vitamix 750. If you've got low hanging kitchen cabinets, this may be a problem for you. Cleanblend does seem to have low profile jar options available, but as of now it appears they need to be purchased separately. OK, it may be obvious, but one of the cheapest ways to get a Vitamix for less would actually be to get a refurbished unit. When you get a refurbished Vitamix, you can be sure that you're not getting any sort of knock off. You're getting a real Vitamix, with the same engineering and the same functionality, usually at a much lower price! The Vitamix 5300 was also one of our number one choices when we did our Vitamix 780 review and comparison. The only difference is you get a slightly shorter warranty when going with a refurbished unit. Instead of coming with the standard 7-year Vitamix warranty, you get a 5-year warranty. If you really want a Vitamix, but price is holding you back, this is the option we recommend you go for. The Vitamix is a nearly perfect blender, but carries quite the cost burden. ​Now that you know the pros and cons of each of the options, its up to you to make the final decision based on your lifestyle!